With the 30 probables starting to drop into the preparatory camp in the Capital for the National Team’s upcoming International Friendly against Jordan, the players in unison, stated that the match will be an “invaluable experience” in the road for the team’s preparation for the AFC Asian Cup UAE 2019. The match, which will be the first-ever International Friendly between the two countries is slated to be played in Amman on November 17, 2018. Goalkeeper Gurpreet Singh Sandhu, keenly looking ahead for the match labelled Jordan as a “very strong team”. “The fact that Jordan are regulars in Asian Cup underlines that the match isn’t going to be easy for us at all. This is going to be a very tough challenge and we need such challenges to better our performances,” he said. Jordan who lost to FIFA World Cup runners-up Croatia 1-2 in their last match, have qualified for the quarterfinals of the AFC Asian Cup twice in 2004 and in 2011. 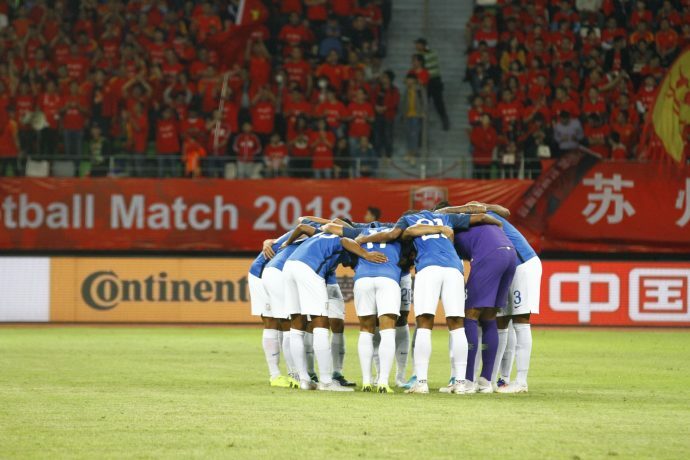 Sandesh Jhingan, who besides captaining India in the last International Friendly against China earned huge plaudits for his valiant display on the day, felt that playing against Jordan will give the team a “better idea” of UAE who are clubbed with India in the 2019 AFC Asian Cup – UAE. Pronay Halder, who played a pivotal role in the midfield against China, recollected his memory of playing against Jordan in the 2014 Asian Games in Incheon. “We will be in a better position to assess ourselves after this game. As a team, we are more confident now and it helps while facing strong opponents on the bigger stage,” he quipped. The Indian team coached by Stephen Constantine is scheduled to depart the Indian shores on November 15 for the match.